Home » life » This duck and monkey were best friends since birth—and died together showing what friendship is! 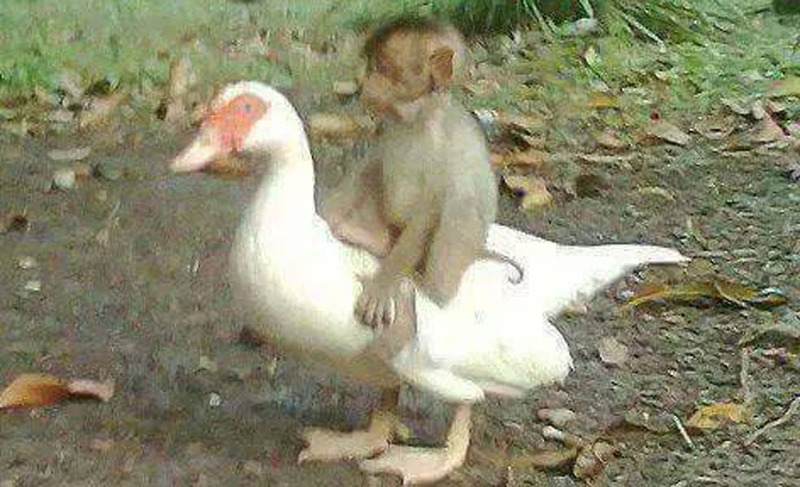 This duck and monkey were best friends since birth—and died together showing what friendship is! Friendship knows no bounds. It doesn’t matter what species you are in. Once you find someone you feel comfortable with—that is when it all starts. This monkey and duck grew up together and became a unique pair. They have lived together for so long, and it is sad to see both of them die together. Their owner breaks down after he sees his two most precious pets, die together because of their ‘love’ for each other. The monkey was apparently playing around when he came into contact with a live wire. The monkey couldn’t get away and started screaming in pain. The duck, hearing his friend’s cries, came to the monkey’s aid. The duck tried to help the monkey get away, but he got stuck as well. Both friends died on the spot. They were born together, grew up together, and died together as best friends. If that’s not true friendship, I don’t know what is.